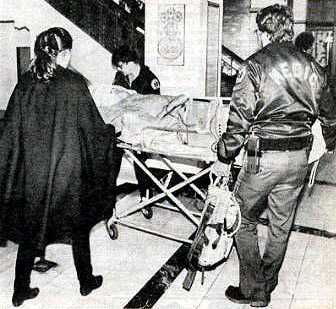 Movie idol Cary Grant is wheeled out of the Blackhawk Hotel in Davenport about 9:15 p.m. Saturday, Nov. 29, 1986, with his wife, Barbara Harris, at his side. Twenty-five years ago tonight is a tense memory. At 11:22 p.m. on Nov. 29, 1986, Cary Grant died in Davenport. I’ve told and retold the story because I was as close to it as anyone in the media. Now, this is it, finale — my last story on the grim anniversary. The matinee idol, a $30,000 package, was to appear that night on the stage of the Adler Theater, the climax of a night of bubbly and baubles celebrating Festival of Trees at the RiverCenter. The Adler was a sellout. Grant was staying with his wife, Barbara, in Suite 903 at what, before the name flip, was the Blackhawk Hotel. The suite no longer exists; during last year’s remodeling, Suite 903 was absorbed into other units. He fell ill during a late afternoon rehearsal and was helped from the stage to his hotel room. Several hours later, it was announced during the pre-performance gala that Cary Grant was ill and would not appear at the Adler. I was the first newsman at St. Luke’s, now Genesis. Hospital people, who are prone to be this way, had nothing to say. Rumors were flying. News people were gathering from afar in an impromptu hospital media room that had been stocked with Swiss cheese sandwiches and fruit. AP showed up in the late hours. The Des Moines Register was there. The Chicago Tribune had flown in a reporter. People magazine had rushed in its regional correspondent. TV camera people and reporters were getting tangled in each other. There was only one phone in sight, on the wall. Remember now, this was 1986 and cellphones were only Buck Rogers fantasies. I told my wife to tie up that only phone and for our newsroom to hang on to the other end, even if it took hours. No other media would be near a phone line. We’d break the news. And there I stood, looking like a penguin in my tux from the party we had left an hour or so before. My wife, beside me, in a glittery formal. Hospital officialdom was stalling. News people were furious. At 12:30 a.m., as the gray hair in this motley crew of media, I was nominated to pound on doors and demand a statement. “Ten more minutes,” we were told. At 12:45 a.m., Dr. Jim Gilson, who had attended Grant in his last hours, stood before a glare of TV lights and announced that the debonair star had died of a massive intracerebral hemorrhage at 11:22 p.m.
My story was phoned in and details wrapped up. About 2, maybe 3, my wife and I walked down a quiet hospital corridor with Gilson, who was munching on a pear from the media room spread. “Guys like Cary Grant are supposed to live forever,” he said. Contact Bill Wundram at 563-383-2249 or bwundram@qctimes.com.